The small but fun sci-fi thriller Split Second has Rutger Hauer hunt a serial killer who turns out to be a bloodthirsty alien. While the film is available on DVD in its uncut form in many countries, a Blu-ray release is a first for the movie and it happens in Germany. An interesting side note is that there seems to be an alternate version of the movie in Japan that features material that exists nowhere else in the world. 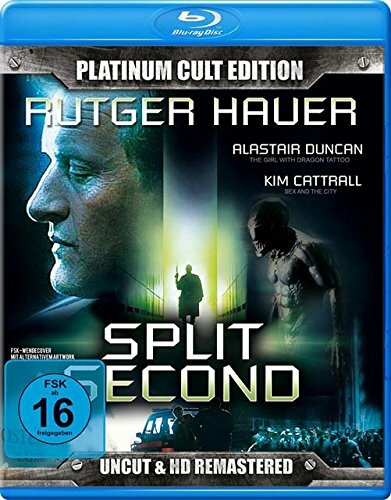 The upcoming release by DigiDreams, called "The Platinum Edition" will have this exotic cut in the bonus section as will the mediabook release by the German distributor '84 Entertainment. An exact release date isn't confirmed at the moment, but end of March to mid of April seems to be realistic at the moment.